DSC_8894, originally uploaded by Midnight Matinee 24. Anything can happen in Derby and anywhen too. 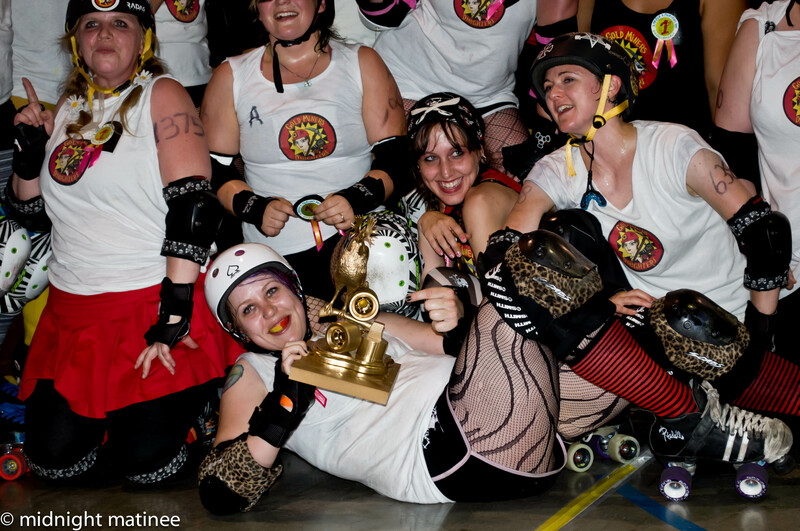 Believe it or not-last night was the first time ever we have witnessed a Rollergettes win on the track. Neither team carried full rosters but those who were there represented their colours as best as they could. It was a closed bout, and it wasn’t all about points but learning on the fly too. There were zebras from as far away as Hammer City and Royal City to make the calls and help guide the fledgling refs of the Rollergettes. Timeouts and learning sessions at the centre of the track entailed referee discussions and talking points with the player. Taking a knee down on the startline, when is it a major? Why doesn’t your team just take off if the opponent doesn’t move? The Rollergettes answered a few questions of their own. Could the Rollergettes without Goldie on the track fend off the Belles of the Brawl. Goldie and others served as NSO while the Rollergettes called their own plays off the bench. Rollergettes old and newer Punkii BrüzHer and Crystal Mess along with Knuckle Slamwitch and Danger! Danger! alike in black took on the green and black of the Belles featuring familiar names such as Justine Sane, Lass Compactor, S. S. Sativa who were all part of 2 Fresh 2 Furious just last month. A fun bout turned in some hard hits and falls and a narrow 55-49 victory for the Rollergettes by the cutoff hour of 10. 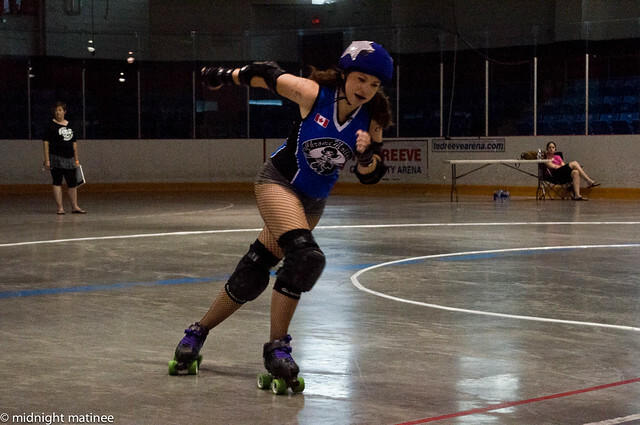 The evening would be a warmup for things to come with Capital City looking forward to hosting the Rollergettes on August 6, while the BCRG crew will be in Dundas on the 13th taking on the Hammer City Harlots. Also on the 13th, the Rollergettes will be holding their last homecloser of the season the Violet Uprising, one of the three teams of Royal City. 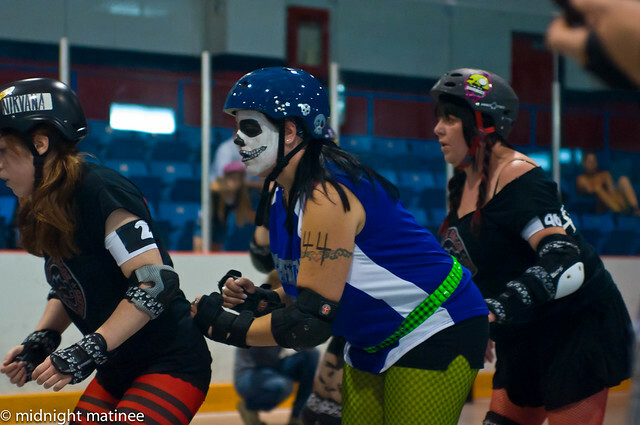 Belles will keep busy on the 27th hosting their inaugural home bout against Ottawa Roller Derby. Good luck to all! August promises hot weather and hot action. Postscript to the Readers out there: Yep, it’s August already and we’re trying to play catch-up with all the Derby from last month. Just be patient, there’s good Derby ahead. Don’t Stop Believing was an appropriate song for the fest that was 2 Fresh 2 Furious. Just think Beast of the East all held in one day running in two arenas down at Ted Reeve Arena way down in the east end of Toronto where Main meets Gerrard Street East. True to the feeling, the Gold Miners’ Daughters, a league of their own from Timmins, won it all in a memorable hard-hitting final over the D-VAS from Toronto Roller Derby. GTA Rollergirls hosted the 2 Fresh 2 Furious tournament as an even more ambitious sequel to the Fresh and Furious equivalent from last year, expanding from 4 to 16 teams this time around. GTAR seemed to be doing what it does best in promoting and developing Derby amongst the rookies and freshies of the world. So players who had only a year ago donned their skates for the first time found themselves coming in with little or no previous matchplay. The tournament limited the experience of skaters on the teams to approximately five games or less with exhibitions and tournaments not counting. So Royal City from Guelph who had entered the tournament with virtually no games to their credit had been the busiest of beavers locking games into their home and away schedule with abandon. It was only recently that a small band of nine Chrome Mollys supplemented by some Debs had travelled up to the home turf of South Simcoe and found tough resistance. And this was only a day after the Debs had gone up to Royal City to face the All-Stars. So the expectation for a toughly fought game from South Simcoe against the Brawlers was in the cards. Thus, 2 Fresh 2 Furious was on. This was the equivalent of Montreal’s Beast of the East weekend tournament condensed into one long Derby day and night. Every forty minutes more or less, the games proceeded apace. The wars on the track in these short 20 minutes of gameplay [supplemented by the proverbial time outs from teams and officials] produced some spectacular falls, races, injuries, collisions and penalties that could be expected from freshie types. Sixteen leagues were represented, some sending two or even three teams [Royal City blended two of their teams Killer Queen and Our Ladies of Pain into the Queens of Pain while the Violet Uprising remained intact]. Belles of the Brawl from Brantford were not allowed to include GTA’s former big hitter Justine Sane on their roster which saddened her. 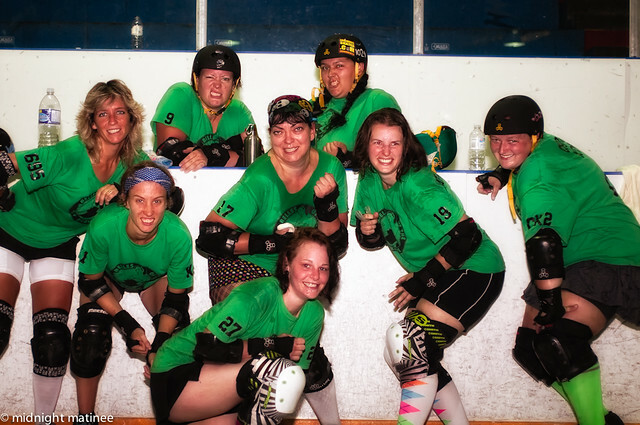 However, the Northern Exposure to Derby was well-represented with the two different leagues from Timmins: Gold Miners’ Daughters and Dark Angels, the Soonami from Sault Ste. Marie sent those who could travel. There had been some foreshadowing from the inner circle of Sudbury that Timmins were a rookie team in the making. Kingston and Peterborough came in with two teams, Durham was back in action, seen for the first time back in the summer of 2010 at The Hangar against the D-VAS from Toronto Roller Derby. 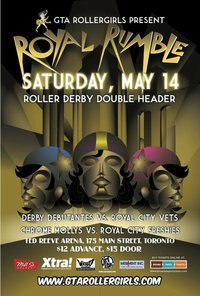 For the first time, Toronto Roller Derby came down to GTA to actually bout and sent in the D-VAS. Last year, Queen City Rollergirls from Buffalo, New York had come to Fresh and Furious with a small group wearing the crown on their pink shirts. Two of the leagues from Ottawa in the form of Capital City and Ottawa Roller Derby sent in teams. This time around, Queen City sent in a full team of Baby Brawlers coached by 90° Johnson, who himself is a full fledged WFTDA referee. At least two of the QCRG may have been seen in Hammer City as part of their Lake Effect Furies all-star travel team who took on the Eh! Team and actually took the MVP. If their stomachs were churning with first game tournament nerves it did not show up in the players on the track. The stress was more likely to happen with the 22 zebras who came in to oversee the matches, rolling in shifts and trying not to get dizzy from it all. There were many recognized zebras by yours truly from the likes of ToRD, Peterborough, Royal City Rollergettes and GTAR. All the action started at the stroke of 11 in the morning with the first two games going simultaneously in The Bubble and the main rink of Ted Reeve Arena. 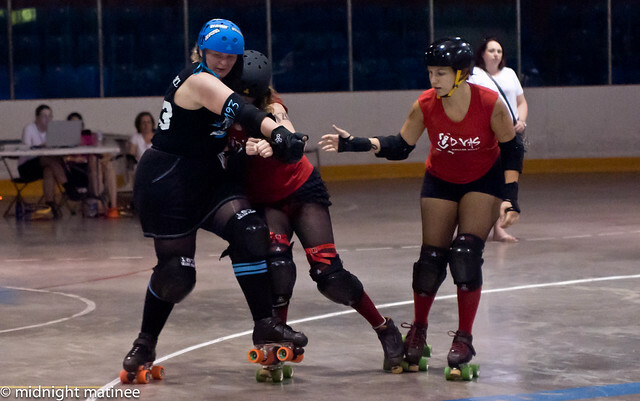 While Durham were going head to head with half of the Kingston congregation that had split into Shirts [with the other half called Skins] the contingent from Border City Brawlers of Windsor were going against South Simcoe Rebel Rollers. Even spectators in the suicide seats have only an inkling of appreciation of what the game is like as seen on the inside. The view from the inside of the track was not only terrifyingly fast at the start, but quite the rush while trying to stay inside the lines of the box created for the occasion and trying to focus hard on the action through a flurry of zebra legs and arms which were racing in pace with the jammers and pack [or non-pack] of players. The calls came loud and often between whistles as the referees shouted at white boards of the NSOs [non skating officials] or the NSOs types who struggled to keep up as they wrote down the penalties on their clipboards before marking the minors and majors on the large board. Many heated discussions during timeouts ensued with coaches and refs over missed calls and points with even referees talking at each other to make sure they had made the right call. One thing that can be said is a referee’s whistle at the end of a jam is piercingly loud and painful. But the major surprise was how loud was the rumble of skates as players engaged in fast and furious action around and around. And the intensity on the faces seen up close. It was indeed blood and thunder on the track. There was a large contingent of D-VAS fans, ToRD signs and coaches who made their presence loud and known as they cheered their teams on. 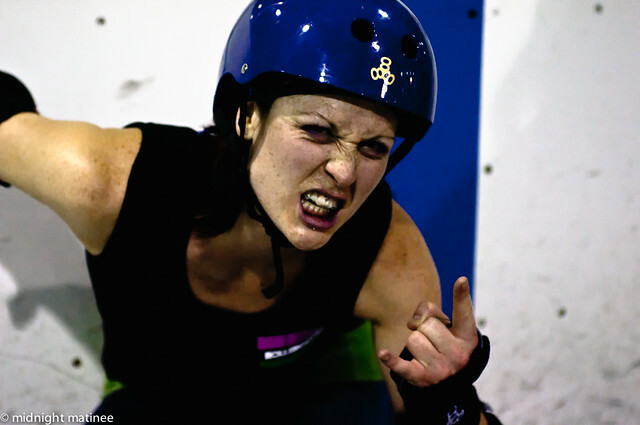 Indeed a few of the leagues present were due to the players turned founder, coach or mentor from Toronto Roller Derby. The temperature outside was a temperate 28 Canadian degrees, or the high 80s or almost 90s outside, but it felt cooler than the swelter that was going inside. The scheduling of winners and losers and double eliminations and then to sudden-death by the quarter finals had teams often playing back to back, just finishing winning one bout over an opponent only to immediately face their next competitors within the next twenty minutes. Cooldown led to more warm-up. There were lots of rebel yells for beer beer beer from teams after they found themselves out of the tourney. Merchandise tables from visiting teams began to disappear as thoughts of returning home or looking forward to the after-party began to arise. The Chrome Mollys shouted “Pizza!” The volunteers and staff and players from GTA Rollergirls lived to setup and lived to serve and barely lived by the end of day. Announcers in the form of Getcha Kicks said cute things about the trophies and remembrances of the first tourney at GTAR which was Virgin Suicides Brawl which was comprised of competing teams: Derby Debutantes, Vicious Dishes and Venus Fly Tramps from Tri-City, Bytown Blackhearts from Ottawa, Death Row Dames from Hammer, and the two Forest City teams: London Thrashers and Thames Fatales. It was there that 76 Getcha Kicks got her first Derby kicks. The hometeam Chrome Mollys playing with only their freshiest crew got off to a winning start over the Ottawa Dollinquents in the second bout of round one in the arena. Then they had the scare of their lives against South Simcoe, the Mollys behind by 20 with time for last jam on the clock. Riley Rage huffed and puffed her way for the Mollys giving it her best shot. As the last whistle blew, the Mollys piled atop their trooper jammer. Although it looked like 34-33 on the scoreboard an officials meeting was called with GTA coach looking for that one more point that would tie the game. Referees called upon the players to keep their equipment on while they consulted. The Chrome Mollys received the needed point and the overtime was on with Beaver Mansbridge on the line. Although Coach kept shouting to Beaver to call off the jam after getting her points the rule dictated the full two minutes must run out, and on both team raced with the Chrome Mollys the victor by two. However, their win would put them into the sudden-death quarter-finals against Queen City’s Baby Brawlers who came through after a surprising first round loss to the D-VAS, then winning two in a row to reach game 21. 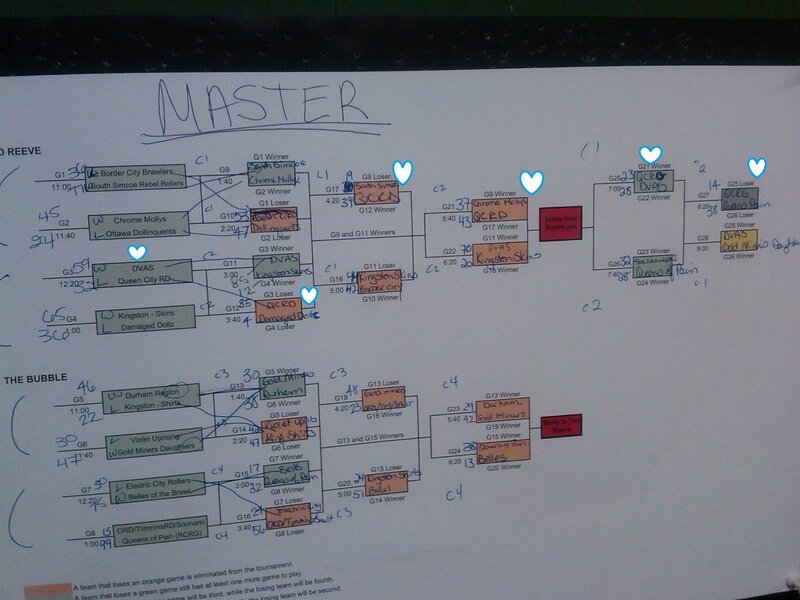 By the semi-finals four teams were left [naturally]: D-VAS again against Queen City’s Baby Brawlers in game 25. In the other half of the draw, the Violet Uprising had been knocked out leaving the Queens of Pain with Hot Cross Guns to represent the royal colours of RCRG facing Gold Miners’ Daughters. The latter two teams had spent the day over in The Bubble with its slippery surface and had to come over into the main rink for the first time, which meant they had eluded our view for the day. We had been warned to look out for 666 Lisa Kill’er Princess and a certain 14 Nasty Nads on GMD. The Gold Miner’s Daughters had just played Sister Slag on Canada Day and had fallen which may or may not have helped to build up expectations against Queens of Pain, but watching them in action, they certainly did not look like this was any rookie team. Jammers getting a running start at the jam line and huge hits. The D-VAS kept up the momentum and knocked out the Queen City Rollergirls who may have been finally running on empty as Hellbat kept up lead. This saddened the merch table lady of Queen City who had been shouting out to her team all day in support. The two teams summoned what was left of their reserves and took to the track for the Battle for third place in Game 27. 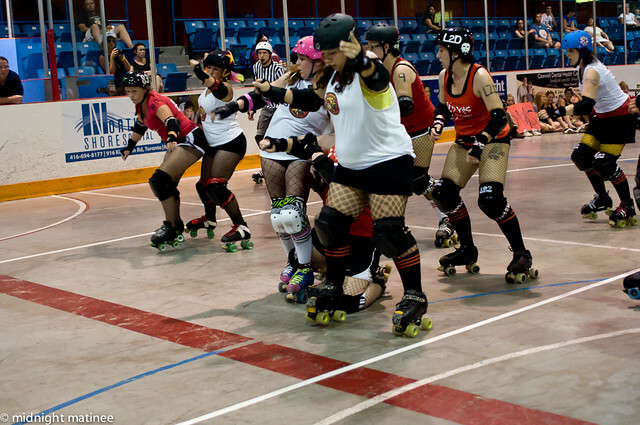 The Queens of Pain [Royal City version] took out the Queen City Baby Brawlers. By 10 p.m. the twenty-eighth and Championship game was preceded by the G27 battle for third place and Queens of Pain – the Queens of Pain proudly prevailing over the black and blue of Queen City Rollergirls Brawlers. At last, the finals were ready to roll. No mention of rough and tumble here lest we get roughed and tumbled out of here. With only few seconds left on the clock of the finals, the D-VAS called time out. Although the score looked unsurmountable, anything is possible in Derby. Witness the twenty point come from behind jam by the Chrome Mollys to tie up the score with South Simcoe. [Or the Champional with Rocky Mountain Rollergirls]. What ensued was total mayhem with were the D-VAS just asking for it? In the moments before the Championship game. the ladies from GMD looked at each other and Rachel NightTrain Matthews said: “‘We got this!’ and then, when we won it, there were just lots of tears and ‘OMG!! '” The Northern underdogs took it! A lot of people in the crowd were like ‘What? '” And she laughs. addendum: 2 Fresh 2 Furious from Queen City Baby Brawlers point of view on the way! Followed by on the road again to Tri-City and Royal City. Stay tuned! 2Fresh2Furious G28 Finals ToRD D-VAS vs Timmins Gold Miners’ Daughters Roller Derby from Layer9 on Vimeo. 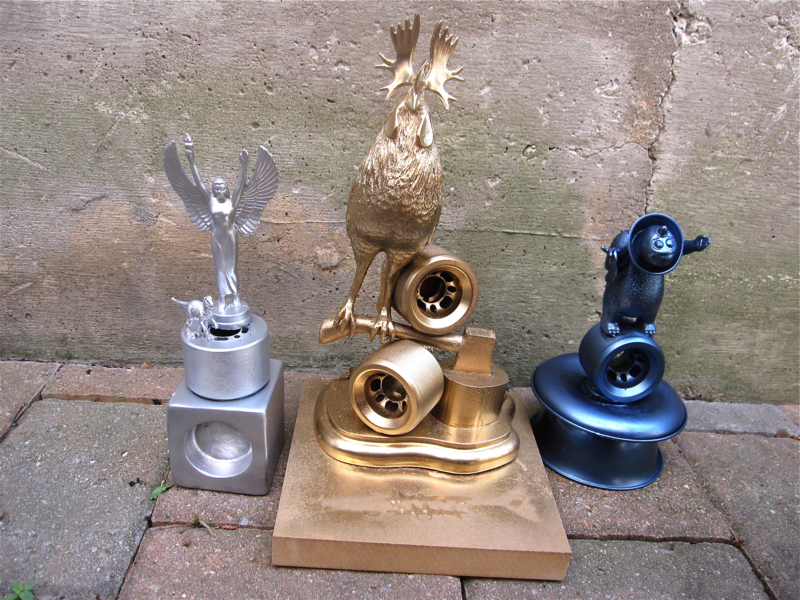 It was great to see so many new leagues last year at GTA’s inaugural Fresh and Furious. Amongst the leagues playing was Sault Roller Derby. 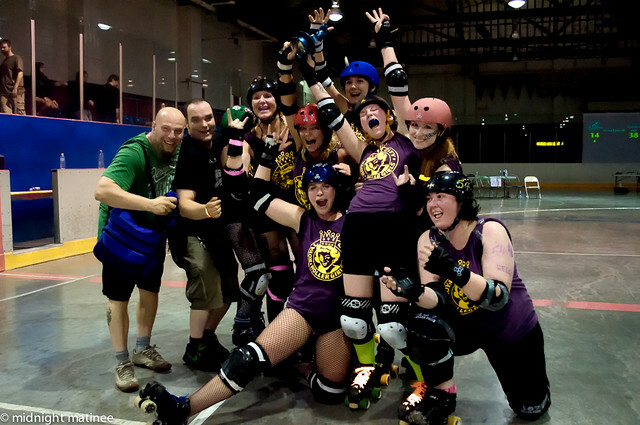 To bring us up to date, some welcome and fresh words from Laura DevilZone up in SRD who venture a little bit northwards this weekend to roll against one of our favourite teams Sister Slag of NCRD. “Our league in Sault Ste. Marie, the Sault Roller Derby League is now a registered NOT-for Profit Organization and we now have our very first team! We are proud to unveil our new team! Please meet the “SOONAMI SLAMMERS” ! We are playing Sudbury (NCRD’s) Sister Slag on Sunday May 29th, in an exhibition game in the town of Espanola. In July, our freshies will play in GTA’s Fresh n Furious II and our seasoned ladies will be coaching, reffing, and helping to NSO for the bouts. We are working on an event for our new team and if all comes together, will be officially announcing the event soon! We would like to invite all derby folks if they are passing through Sault Ste. Marie to come skate with us or visit anytime! Just FB message or give a shout out and we’ll hook you up with a practice time! The teams of GTA got deep into a Royal Rumble with the Royal City Rollergirls from Guelph on a cool and rainy Saturday night. But inside, the action was more than hot and primed. Royal City Rollergirls from Guelph came into the well-packed arena at Ted Reeve on a Saturday night more than ready to rumble against GTA who were officially launching their season. The crowd was more than ready to rumble as well.